MOD is the video file format produced by certain digital camcorders from JVC, Panasonic, and Canon. Although these videos have a specific file extension, they are pretty similar to the more common MPEG-2 files and can be played on almost any PC or Mac. However, if you want to watch MOD files on a mobile device, you’ll need to convert MOD to a more compatible format. 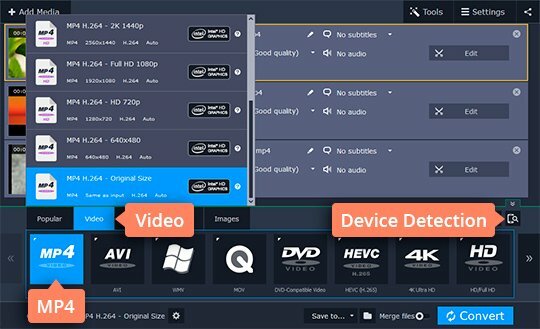 With Movavi Video Converter conversion software, you can change the format of your video or rip a DVD with just a couple of clicks. The program supports a wide range of media formats, including AVI, MOV, MP4, WMV, and MPG (MPEG). 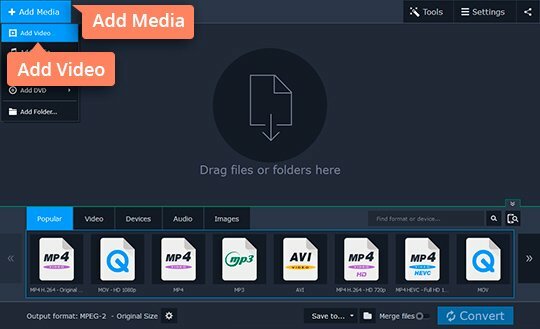 You can also use Movavi Video Converter to extract audio from video and convert music to and from MP3, AAC, WAV, WMA, and other audio formats. 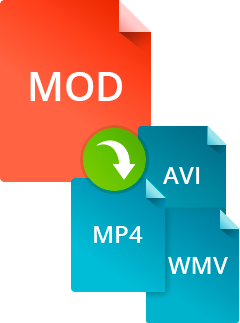 Converting MOD video is really easy – just follow the four simple steps below. 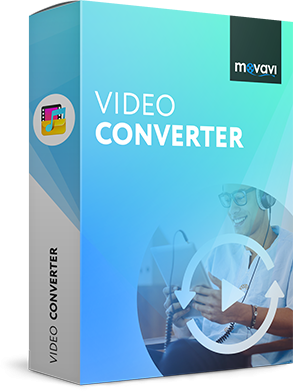 To install Movavi Video Converter for Windows or Mac, download and run the program, following the on-screen instructions to complete the setup process. Click the Add Media button, then Add Video, and choose the files you want to convert in the new window that appears. After you click Open, the files will be added to the video converter file list. 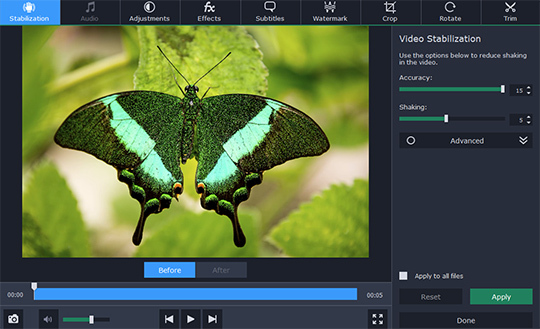 The app helps you edit any video prior to conversion. Hit the Edit button in the file info section to access the editing window. Stabilize your shaky videos in the Stabilization tab. Change the volume level if it’s too low or even get rid of background noise in Audio. Experiment with video display settings in the Adjustments to achieve the desired effect. Insert effects, subtitles, and watermarks in the appropriate tabs. Trim away unwanted details in the videos, rotate the clip footage, and crop the edges – just select one of the respective tabs on the right. To compress a file that’s too large, click its size value in the description section. Specify the values for quality, bitrate, and size. Hit Convert Sample if you want to see the way your file will look after conversion. Select Video in the lower part of the screen if you want to convert your video to a specific media format or Devices if you want to create a video that will play on a particular mobile device – smartphone, tablet, or media player. Then, choose the appropriate ready-made preset for that device. You can also let the app determine the preset you need by connecting your device to the computer and clicking the Cell Phone icon. 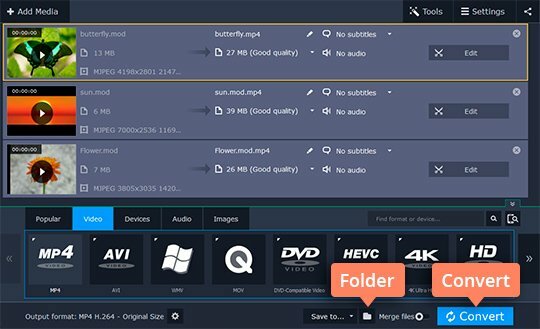 Now it’s time to choose the folder in which your converted videos will be saved. Click the Folder icon and specify the new output folder or stick with the default Movavi Library folder. All the necessary settings have now been specified, so you can start converting your videos. Just click Convert and wait for the process to finish. After the conversion is complete, the folder containing the finished videos will open automatically.